Outside our window Paris is in darkness, a beautiful moody cityscape, the rooftops and buildings moonlit greys, an occasional splash of gold as early risers windows begin to glow. We rug up in our warm coats and scarves and set off on an early morning adventure. We walk slowly to the metro station enjoying this magical part of the day. The soft golden street lights break the darkness, dropping glistening pools of light along the long dark street, shiney and wet from the rain. The cafe on the corner is lit up and there is a little bit of activity. I’m not sure if it is just opening for the day or if it a service continu establishment that has been going all night. We head down the stairs into the belly of the metro, excited to get to our gourmet shopping morning.Two words sum up our plans for the day, charcuterie and fromage – meat and cheese! We are on the train headed to Vaneau station in Montparnasse to find some of the best in Paris. The morning is still quite dark when we pop up onto Rue de Sevres and wander along looking for our cheese shop. Its a lovely neighborhood and clearly gourmet heaven. We Pause for a moment at La Grande Epicerie de Paris and I press my nose against the glass wishing it was open. Behind the glass this amazing store looks so tantalising with its gorgeous glittery Christmassy displays. We continue walking and it’s not long till we spot the big green awning with those magical golden letters Quatrehomme. 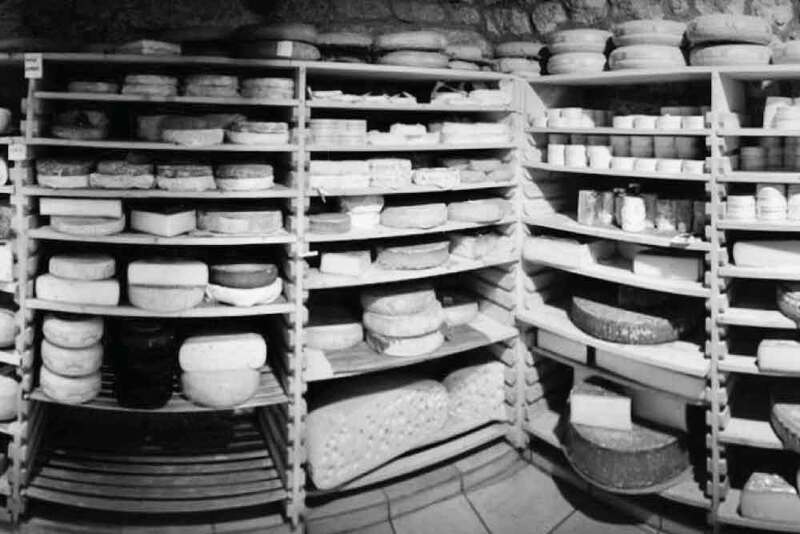 Marie Quatrehomme is known as the Mistress of Cheese. She is the first woman to be awarded the Meilleur Ouvrier de France (best craftsman in France) as a fromager. The store has been in the family for years with Marie’s children Nathalie and Maxime now 4th generation cheese makers. In 2014 Marie was further honored by being promoted to de chevalier de la Légion d’honneur (Knight of the Legion of Honor) which is the highest honorary decoration in France. There is a lot of cheese in Paris but today we are looking for the best. We are a little early and the shop isn’t open yet so we find a little cafe a few doors down and order a couple of noisettes at the bar and take advantage of access to their bathroom. I love observing the Parisian lifestyle and today my heart is warmed as a dear old love, elegantly dressed in black; coat, gloves and lovely hat, hobbles into the cafe and drops a few coins on the counter. Not a word is exchanged, the chap nods and makes what I assume is her usual coffee. She takes it lifting her chin with a kind of Edith Piaf style nonchalant sneer, the body language saying “thank you that will do fine”. He nods and lowers his eyes, without a word I get “of course”. Two or three sips and she has knocked back her coffee and leaves to continue her morning. I just hope I’m as vital at her age, perhaps I might even be living in Paris! We finish our coffee and head back to Fromagerie Quatrehomme eagerly hoping it has opened it’s doors. Yes! We walk into a most wonderful space. I look around at the extravagantly wide array of cheese and it is like nothing I have experienced before. There are apparently something like 450 different types of cheese in France and I think they might all be here! I’m fascinated, there are some very gnarly looking aged cheeses as well soft fresh curd just asking to be eaten quickly. A lovely young lady assists us to collect a wonderful selection.She is very patient and spend quite a bit of time with us explaining the details of each of the cheese we enquire about and offering tastes of things if we would like. What we would really like is to just keep putting pieces of cheese in our shopping bag. We start with a large wedge of aged 2012 Comte. A ripe, creamy, nutty Rocamadour (goat’s cheese) that is absolutely ready to eat. Brie Aux Truffes that has been made to celebrate the truffle season. Then a generous tranche of Regalis, an incredible ewe’s milk blue from the south of France near the pyrenees. It is such a lovely blue, less sharp and mineraly than a Roquefort. And Vieux Bernois, the dark thick bloomed crust hides a pungent very robust cheese – definitely not one for the feint of heart. We are at the counter excitedly watching our young lady wrap all of our selections when we spot a wonderful Raw Milk Butter so in it goes. My love asks mademoiselle if there is anything else we need. With a wicked little grin she says “I think this will do. You will eat this by tomorrow and we shall see you again after that”. We leave with a wonderful bag of amazingness filled with the anticipation of tasting it all later. We are all vibed up, excited about our cheese haul. Our next important stop for the day is a few blocks away. Gilles Verot is one of France’s most famous charcutiers renowned as a master of pork. He has a number of businesses around the world including a New York Brasserie and a London Bar but he began his career following the family tradition of pork butchery. Verot has grown his reputation for head to tail respectful treatment of the pig. Leading chefs worldwide seek out Gilles Verot charcuterie for their Michelin-starred menus. Today I am filled with eager anticipation as my love leads me to Verot’s charcuterie in the 6th Arrondissement. We skip along rue Notre-Dame des Champs at a pace, inspired by the idea of the best cold meats in Paris, looking for Monsieur Verots store. The shop front is elegantly understated, a dark blue facade with simple gold script and a little pink piggy sitting atop a small oval sign “Verot” dangling from a scrolled black metal arm denotes that we are here. We have seen and admired many a butcher’s window in Paris but this is something else. Pates, terrines, saucisson, terrine en croute each so beautifully crafted. The terrine de cochon de la tete au pied (pig from head to toe), is a true masterpiece. Constructed with layers of “head cheese” (made with from rendered tongue, cheeks and skin), apples, boudin noir, classic pig intestine andouille and shallots. I love the structure and form of everything, particularly the terrines, to me each an artwork. Layers of colour and texture, rich matt meaty layers, translucent glossy gelatinous layers some wrapped in rich golden pastry.There is just so much to see here and I can’t figure out what I don’t want, I would love to take a little of everything. If I were a more permanent Parisian I could come back each week and slowly sample my way through the entire selection. Actually one of the wonderful things you can do as a Parisian is cater your dinner parties. You order in the full menu and simply warm everything up in your little apartment kitchen. Verot has a most spectacular menu for just such an occasion. Today though we are just shopping for two. A very helpful young man with very little english helps us to select several tranches of pate including a duck a l’orange en croute , a selection of terrines, I’m particularly excited about the beautiful looking rabbit terrine and of course we cannot leave without Jamon. The large leg from which it is carved stands like a sculptural installation at the back of the store. What an exciting and for me emotional morning. Food and art have always been the same for me and getting to celebrate some of France’s best artisans has been very moving. I have a deep respect for these people whose dedication and passion for good produce has allowed me to savour and indulge myself in the beauty of their artwork. We reluctantly tear ourselves away from Gilles Verot and head back to the Saint Sulpice metro station to catch our train home. Our shopping bag is full of such a magical collection. All we need now to survive for several days (perhaps weeks) is baguette and vin rouge!